Backpacking across Europe – it sounds like a dream to travelers, students and even families. But not everyone has the funds to pay for what could be a pricey vacation. 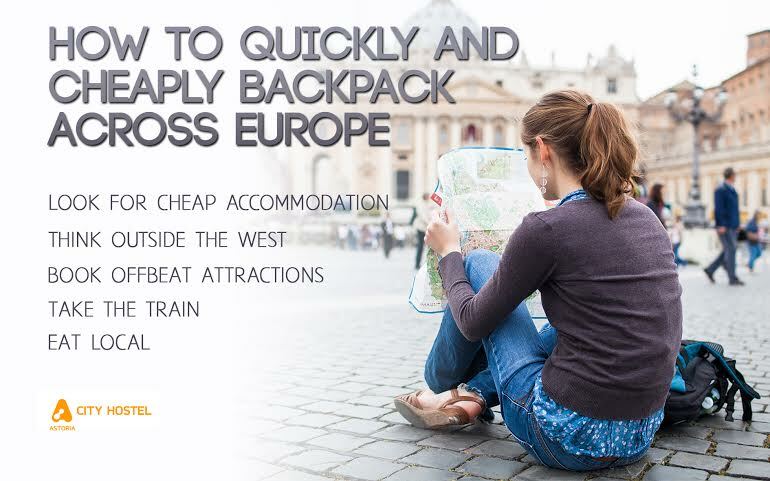 From accommodations to travel between countries, if you’re not careful, backpacking across Europe can become a serious expense. By researching your options carefully before hopping on a flight headed overseas, you can find ways to cut costs without sacrificing any of the cultural experiences of a European travel-based vacation. While flights are universally quicker than rail travel, they’re also usually more expensive. And when your sights are so close together, the time savings may be negligible. What’s more, InterRailing between countries gives you the chance to see the landscape as you could never while 30,000 miles in the air. By purchasing an InterRail pass, you get more for your money – more travel and more experience with the ability to make the most of your Euro experience on the rails. While you might be craving some McDonald’s after a few weeks out of the country, make sure you go ahead and try the local cuisine as well. After all, food is one of the best experiences for travel and what’s more, it’s usually much cheaper to eat local than to seek out a chain restaurant. Instead of expensive formal dining venues, look for traditional cafes and restaurants that offer plenty for your buck. You’ll leave with a full stomach and even better, a full wallet! While Western Europe does offer a number of tourist attractions, backpacking through England, France and Italy can be expensive. These countries are more than happy to take a tourist’s dollar, so you may not get as far. Instead, consider backpacking through Eastern Europe. Countries like Croatia, Turkey and Russia will give you more bang for your buck, thanks to the cheaper attractions, accommodations and food that you’ll enjoy there. Transportation costs are also often cheaper in the Eastern countries, so you may want to think outside the usual suspects when you’re planning your travel itinerary. Sure, a plush hotel may be the most amenity-rich place to stay, but backpacking means traveling with little and getting a lot of out of the experience. Ditch the pricey hotels and look for cheaper accommodations, like hostels. You’ll get a comfortable, safe bed for the night but you won’t be paying a ton for the privilege. It’s also a great place to meet fellow travelers with similar ideals. Just make sure to check hostel reviews online before you commit to spending a portion of your trip at a specific place. Certain attractions may be worth the price, but it’s up to you to decide which experiences you really want to invest in. Maybe you want to splurge on that expensive museum tour, but make sure you also look for cheap, offbeat ways to take in the culture without spending a ton. Going for a community theater instead of a pricey downtown play can help you save money without sacrificing the experience, while free museums, performances and nature-based experiences such as hikes can help you save money. While backpacking around Europe is sometimes billed as a cheaper way to travel, smaller expenses can add up. Make sure you plan your trip thoroughly and look for the best deals or you could find yourself going over budget. With an eye on expenses, you can enjoy all that Europe has to offer without emptying your bank account. Ashley Williamson is a freelance writer and blogger. Recently in her writing she has been sharing her advice to try and help people enter back into the job market. When she is not working she likes to travel and discover hidden places around the globe.